I live about a mile and a half from the Pacific Ocean and I have wanted to put together a beachy theme tablescape for a while. Been mulling it over in my mind for awhile and finally pulled it all together and it seems appropriate with the hot weather outside. We saw the whale centerpiece on a long weekend my husband and I took a few years ago. It was really expensive so we passed on it. But I found it later online and because it was a second with an imperfection, it was much cheaper and I bought it. I often have it out in the summertime. Took the photo before I added flowers. I used to collect glass blown animals starting when I was about 10. As an adult I continued to collect glass animals and other glass objects until I ran out of room. The glass octopus has always been one of my favorites. The Waterford glass conch shell, a gift from my husband, is heavy and another of my favorites. My husband bought the glass starfish for me from a glassblower in Laguna Beach many many years ago. There is a funny family story about it breaking many years ago (since mended) and to this day no one in the family will admit who did it. The seashells came from a trip to Baja early in our marriage or from a vacation trip to the Carolinas or were part of a group I bought somewhere. The clear goblets are my Waterford Lismore wedding crystal and the vintage blue hobnail goblets came from ebay. The beaded chargers came from Williams Sonoma a few years ago. I watch and wait till things I like go on sale. The blue melamine dinner plates came from HomeGoods as did the white salad plates. 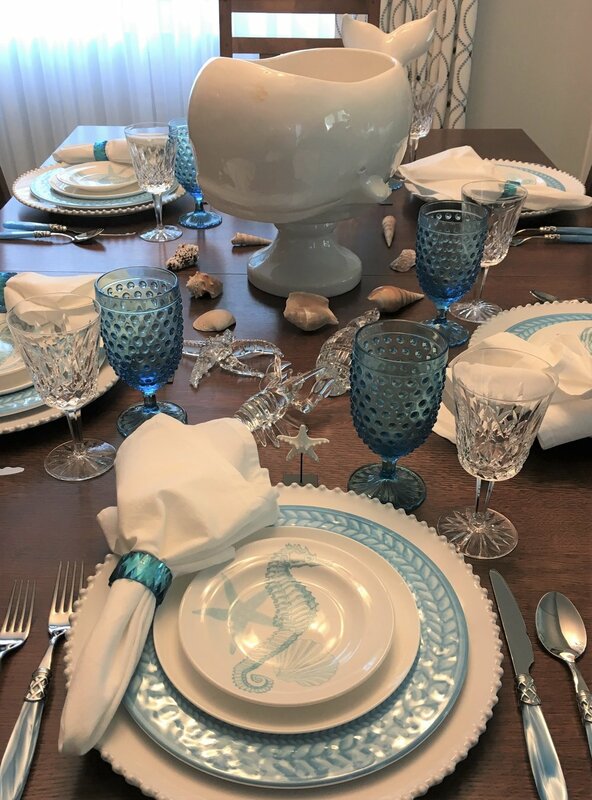 The small crab plate is made by 222 Fifth and is part of a set of four that includes the crab, a seahorse (first photo) , an octopus and a starfish. There are similar sets for sale on ebay. I purchased the plastic napkin rings on Etsy, I have them in other colors also. I bought the white napkins recently at Pier1, they often have good sales on napkins. The flatware is Vietri Aladdin in Aqua and I got it on sale at Bloomingdale's. I bought a gray set as well, that's a difficult color to find. I love the crossed design and the frosted color. Can't remember where I got the starfish place card holders. By the sea, by the sea, by the beautiful sea!